I had assumed, because I’d heard so much about it, that the Okavango Delta would be my favorite stop of our second African safari. It WAS wonderful, but I think Chobe National Park in northern Botswana ended up at the top of my personal best list for this trip. I know that the location of our thatched cabin had a lot to do with this. We sat perched on a hillside overlooking a canyon that created a natural pathway for a parade of various animals walking to the Chobe River below and to our right, and from our little deck, we could easily watch the changing show. Rob in front of our "treetop" cabin. We actually never had trouble with mosquitoes on this trip, but it was comforting to have the netting. View of the Chobe River from our cabin. The canyon below was a natural pathway for a variety of animals to travel to the river. Roxanne and Joan take in the view below. Can you spot the kudus in the canyon? Water bucks below our cabin. But let's back up a bit. Our arrival in Chobe took place after a long morning of travel. Three small planes picked us up at the tiny Kafue airstrip early in the morning and flew us to Livingstone, Zambia where we boarded a bus for the journey. Before leaving Livingstone, we visited Dambwa Market, an authentic local market - dirt streets of stalls filled with produce, home goods, dried fish, and pottery. Our tour group looked a little out of place in this neighborhood marketplace, but we were welcomed warmly by the young woman selling the brightly decorated chitenges - the long skirts worn by almost all of the Zambian women. Several of our group, myself included, purchased as least one of these multi-use garments. Lou and Rob explore the market. Chitenges are used as baby slings as well as for skirts. After the market visit, we continued on to a crowded wharf on the Zambezi River. Like the four states at Four Corners in the American southwest, this was a spot where four countries meet. We stood in Zambia. Zimbabwe and Botswana were across the river, and Namibia lay to our right. We saw the ongoing construction of a huge bridge that will eventually connect Zambia to Botswana - but for now, the only way to cross is by boat or ferry. We drove past literally miles of trucks lined up to cross the river on a ferry that takes one truck at a time! Some of the young men who drive these trucks have to wait for days or even weeks. We could see the result of the boredom and frustration when we witnessed, through the windows of our waiting bus, a young man stealing a pair of shoes from another and taunting him for several minutes. The onlookers just watched passively as the two adversaries circles each other, occasionally swinging half-hearted punches. I was more than a little shocked that no one came to the aid of the young, much smaller man. Thousands of trucks wait for passage across the Zambezi River. Our group heads across the river. Finally, our transport paperwork was finished and we boarded the boat that carried us across the river to the visa office in Botswana. A final bus ride took us to the Baobab Lodge where we were once again warmly greeted by the staff and shown to our hilltop cabins. The staff of Baobab Lodge welcomes our group with song. Charles and our Lodge manager hand out the room keys. Once we were all checked in to our rooms, we boarded our Land Rovers with our new drivers, Moses and Six, for an evening game drive along the banks of the Chobe River. Chobe National Park is a lovely spot of forested hills filled with blossoming teak trees and dotted with baobab trees. As you approach the Chobe River below, the trees thin out into more open hills and plains. The riverbanks are filled with wildlife: families of elephants drinking and bathing in the cool water, hippos bubbling in the grassy pools, crocodiles lounging in the shallows, and a profusion of water fowl and other birds. This large baobab still had all of its leaves. Many of the baobab trees showed damage from elephants. Our days were filled with the usual rhythm of the African safari. Up early for breakfast and a game drive in the cool of the morning, lunch and a long rest back in the camp, then a late afternoon drive until sunset. But in spite of the regular schedule of each day, there was no boredom because our days were always filled with such glorious sights. Giraffes, Cape buffalo, wart hogs, black-backed jackals and spotted hyenas, and herds of antelopes: the ever-present impalas, kudus, red lechwe, and water bucks dotted the hillsides of the park. It is hard to describe the joy of seeing so many animals thriving in their natural environment. Red-billed ox peckers keep the giraffe free from pests. A lone cape buffalo stays cool...and safe from predators. The local people say that wart hogs "pray" when they eat. A warthog has a face only a mother could love - but to me, there is something appealing about them. We encountered the lovely, graceful impalas everywhere in the park, sometimes alone or in small groups of males, the "losers" in the battle for a harem, but more often in herds. These two young males had a little battle right in front of us. ...and the plains along the river. We frequently encountered the impalas on the road. This ox pecker actually stuck his head in the impala's ear to find ear ticks. The kudus also ranged throughout the park, although not in such great numbers. The red lechwe is a semi-aquatic antelope that often swims out to the islands in the river for safety. We could identify the water bucks by the "target" on their backside. The large mammals were the most obvious residents of the area, but there were other little gems hidden in the park. This African tree squirrel poked his head out of the tree just in time for me to snap his photo. Chobe is also known for one of the highest concentrations of elephants in Africa, with a population of up to 50,000. We saw them frequently, especially along the riverbank where they enjoyed drinking, bathing, even swimming! Moses shows us an elephant skull by the side of the road. Elephants grind their way through several sets of molars in a lifetime. The honeycomb structure of an elephant skull helps reduce the weight of their great head. Our group arrived at this spot just in time to see a parade of elephants heading to the river. We learned that elephants are good swimmers. There was always something interesting to see down by the riverbank. Whoever built this safari camp forgot to consider the river level following the rainy season. The camp was partially submerged in the river! There were several other especially memorable animal encounters. A small pride of lions, led by a handsome black-maned male, prowled the bush right beside our vehicle. I was glad Rob was on the lion side of our Land Rover. We were very close to the lions. I'm always amazed by how much the big cats resemble our kitties at home. Enjoying a snooze in the shade. Further on, a large mob of banded mongoose, including a number of youngsters, scampered by. And, of course, there were the birds – nesting eagles and vultures, lots of my favorite little lilac breasted rollers, a rare sighting of the secretary bird, and a large variety of the shore birds that live along the banks of the river – ibis, egrets, herons, plovers, spoonbills, and more. We saw only a fraction of the more than 450 species of birds found in Chobe. Short Tailed Eagle opens his wings for warmth and to get rid of parasites. The double banded sand grouse is well camouflaged. Our game drives were punctuated by morning breaks and evening sundowners...a good chance to rest a little from the constant bouncing over the dirt roads, to get some refreshments, and to share stories with our friends in the other vehicle. The next day, our break was by the river. On the second full day of our stay, some of our group took a hike down to the bridge that crosses the Chobe River and connects Botswana to Namibia. It was a hot afternoon, so Rob and I chose to stay and rest. But two of the most memorable animal encounters took place right back in our camp! During our siesta time on the first full day, a herd of elephants clustered around the large conical termite mount just below our cabin. One of the elephants had pulled a water pipe and hose right out of the ground and poured the water flowing out of the pipe directly into his mouth. It was fascinating…but also a bit of a problem, as this was the camp’s water supply. After about 10 minutes, camp staff in two vehicles approached the herd cautiously. The elephants were quite happy with their discovery and were reluctant to leave. It was unsafe for the staff to get out of the vehicles while the elephants were circling, so one of the vehicles revved up its motor and moved in, succeeding in scattering the herd so the staff in the other vehicle could repair the damage. The frustrated elephants watched from the upper hillside, but finally moved on toward the river. This clever elephant discovers he can get a nice cool drink from this handy hose. Lining up for a drink. Here comes the camp staff to spoil their fun. The elephants scatter while the staff repairs the damage. Well, if I can't get a drink from the hose, there's always Mom! The elephant family finally gives up and heads to the river instead. The next afternoon brought more laughter when a large boisterous family of baboons moved in and entertained us for a good long time. Some of the elders sat alone surveying the scene, while others clustered in pairs or small groups to groom one another, carefully parting hair and removing any pesky parasites hiding inside. Children scampered rapidly around the canyon floor, wrestling, leaping up into the trees. Tiny baboon babies clung to their mothers, sometimes timidly venturing out to see what their older brothers and sisters were doing. Susan and Lou watch the baboons from our Lodge balcony above the canyon. This stay also included our introduction to the history of Botswana and the local culture. On one afternoon, two women from nearby Mabele village brought some of their beautiful woven baskets and jewelry and demonstrated the intricate weaving techniques and the natural dyes they used. The next afternoon, we learned more about the history and government of Botswana - which, by the way, should be pronounced with a long O (Boat-swana). Our guide, Six, told us that the country is in the top 10% of African developing nations, with income coming primarily from diamonds, tourism, and beef. 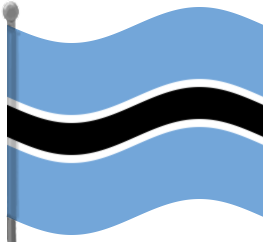 Once known as the British protectorate of Bechuanaland, Botswana gained its independence from Great Britain in 1966, but had a more peaceful transition that its neighbors. Six showed us the nation’s flag, explaining that the large black stripe represented the 97% of the population that is black, but the narrow white stripes recognize the 3% of the citizens who are white. The country is not without its problems. Unemployment is still high, and there are whispers of corruption in under the last president, but Botswana does appear to be more stable than the other countries we visited on this trip. All three of our evenings in Chobe ended with gorgeous sunsets…fitting ends to such special days! The view over the river as we returned to camp. And, as in each of the camps, our last evening included a special time of sharing dancing and singing with the camp staff. This was a special celebration, as it was also Elizabeth's birthday! The gorgeous and unforgettable view from our cabin on our last evening in Chobe National Park.